Rinse then drain the lentils and set aside. Peel the carrot and sweet potato and chop into medium sized pieces. Place on an oven tray and drizzle with 1 tablespoon of the olive oil. Sprinkle with a pinch of salt and pepper and bake for 20-25 minutes until cooked through, and nicely browned. Heat the remaining oil in a large saucepan at medium to high heat, add the onion and garlic and saute until the onion is transparent and slightly browned. Add the vegetable stock, spices and lentils and bring to the boil. Reduce to a low heat and add the roasted sweet potato and carrot. Simmer uncovered for 10-15 minutes, or until the lentils have softened. Allow to cool slightly then use a stick blender to process until smooth. If the soup is too thick for your preference add a little water and re-blend until your ideal texture is achieved. 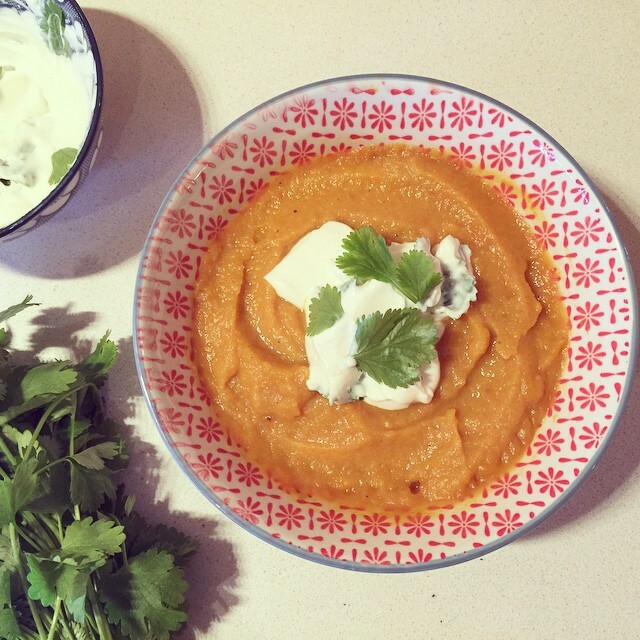 Divide the soup evenly between four bowls and top with sour cream or yogurt and garnish with the fresh coriander.